For each race and gender. individual times will be posted on Sportstats once the races are finished. Foulée des Parcs is an accredited race, with an official time on Sportstats for each registered runner. It offers a great challenge to the athletes, to have fun and put time in their personal history. All children aged 12 and under will receive a medal for participation. Participants are classified by age according to their age on race day. For all races – the 1 km, regular 2 km, 5 km, 10 km and Family-and-Friends-Challenge – , three medals (Gold, Silver and Bronze) will be awarded by gender categories (the 2 km stroller race will not be divided by gender). There will be three first places at the Family-and-Friends-Challenge: the fastest team, the team with the largest age difference between the participants (between the youngest and the oldest) and the team with a “touch of madness”. 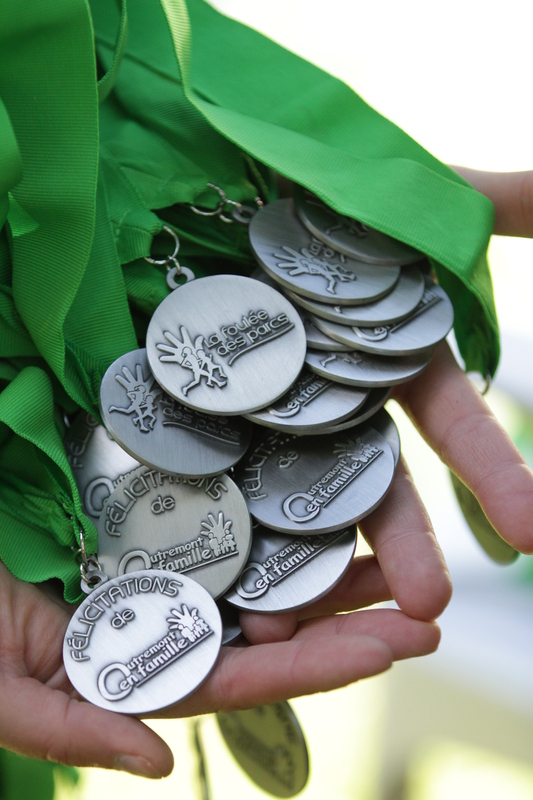 Medal presentations will take place at 9:35 am (10 km) and at the end of the Family-and-Friends-Challenge, and at around noon for the other races ( 5km, 2 km, 2k m stroller, 1 km, Family-and-Friends-Challenge).